An extra $50 bankroll bonus to play the popular sci-fi-themed Six Million Dollar Man slot game is drawing players to open accounts at the popular online casino destination. LONDON, UNITED KINGDOM – (Marketwire – April 2, 2013) – Titan Casino announced the release of a new lucrative slots promotion today, offering $50 to new players who sign up and make their first deposit with a special Six Million Dollar Man-inspired bonus code. Casino fans who wish to take advantage of Titan Casino’s special offer have it easy. All they need to do is sign up for a new real money account, make a first deposit of at least $20, and enter the bonus code “6MDM“. The extra $50 will automatically be reflected in their Titan Casino account balance. Notably, however, this is a limited-time offer, valid only from April 2–30, 2013. 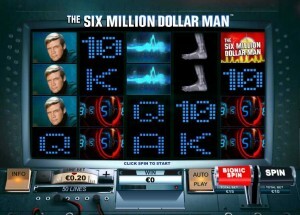 Titan Casino :: The Six Million Dollar Man slot - PLAY NOW! The Six Million Dollar Man slots are themed after the popular 1970s-era American TV show about a former astronaut with bionic powers. Promising a back-to-the-future adventure for everyone who steps up to spin the reels, The Six Million Dollar Man slots offer high payouts and the chance to collect free games, extra random wilds, and much more! Clearly, this special Titan Casino $50 deposit offer is a unique opportunity to start off on the path towards becoming the next Six Million Dollar Man, or woman. As a member of the Playtech-powered Titan family of brands, Titan Casino has for years proven to be the standard bearer of quality service and excellence in gaming. Titan Casino boasts over 400 popular casino games available on a hassle-free, secure platform, with 24/7 multi-lingual support. Dedicated to delivering the highest bonuses online, Titan Casino offers new players an astonishing $5,000 Welcome Bonus.